Do you need more useable space at your commercial kitchen Perth? Kustom Interiors brings a renovation service with modern equipment for your project at an affordable price. When planning a change in your commercial kitchen in Perth, contact our experienced craftsman at Kustom Interiors.. Whether working with a heavy duty commercial unit or small countertop appliances we are here for you. Always using only the highest quality standards throughout the process. From the start we will organise a demonstration to help you make the right choice. Starting with the use of 3D technology, we have the ability to present you with your completed look. Once this is created, you can make changes to your commercial kitchen to ensure the outcome will suit you. With quality high end equipment we will always deliver the commercial kitchen you are looking for. We can install a large range of products including, custom stainless steel benching, sinks and shelving, canopy exhaust hoods and extraction systems. We can also provide you with upright and under counter refrigeration. This does not stop here, we will outfit your kitchen with custom refrigerated or ambient display units, cool rooms, freezer rooms and store rooms. At the same time we can create custom pizza bars, kitchen larders, wall panelling and equipment stands. Finally we will outfit your custom preparation area or wash up areas with integrated sinks and scrape holes etc. 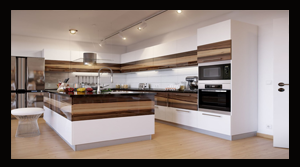 Standardized products are, however, the exception as most units can be modified, or even whole new specifications met for a particular kitchen. Whatever size your kitchen is or your budget, contact us today for a tailored service.